As part of our morning time, I wanted to introduce K to the idea of gardening and watching a plant grow. Gardening is one of my favourite activities to do with young children, as watching something alive grow before your very eyes is somewhat magical. I'd planted seeds with older children in my Primary classes before, but never with such a young child. As with all young child activities, I needed to make the steps as clear and simple as possible. So with a few tweaks in my presentation, and a couple of trips to the home garden store, we were ready to plant. First, we prepped a planter box out on the deck. I really like this box because it's about hip height for K and just big enough to keep our plants. K and I removed the weeds and old plants with a gardening tool set from For Small Hands and fluffed the soil a bit with the hand rake. Another day, we prepared our seeds. I found these window box Jiffy peat pots at the home garden store, which are just the perfect amount of challenge for this age. The pots offer a very clear place to plant a seed (control of error!) with minimal steps. Plus, they puff up before your eyes when you water them, super fun to watch! 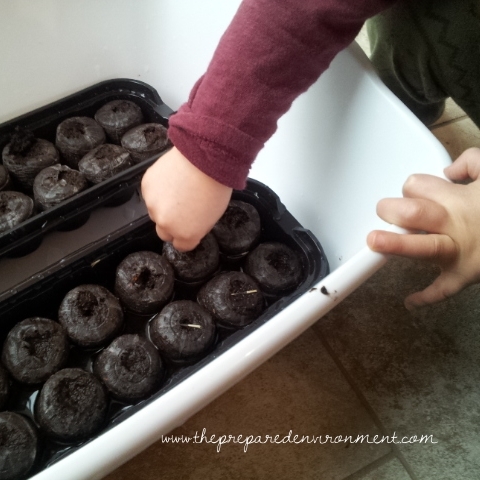 I suggest doing this activity outside or using a large tub like I did to contain extra water and soil. I set up a bucket in this tub with a small rubber bulb baster for K to transfer water, but after seeing that wasn't going well quickly switched the bucket for a pitcher of water. Next time, I would use the watering can. 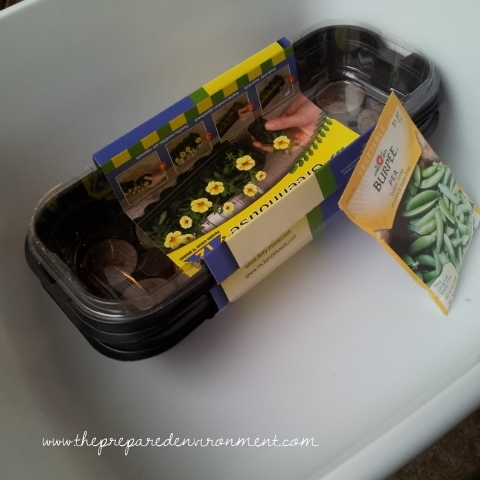 I chose a flower and a vegetable to plant as an introduction to gardening; a packet of snap peas (easy to grow, large seeds, and shade tolerant) and a packet of marigolds (easy to grow, unique seeds, and a very different plant than a pea vine). K really enjoyed watching his seeds grow in the window. After a week, the peas were ready to transplant! For this gardening activity, we added some new potting soil into the planter for our baby pea plants. (The marigolds aren't quite big enough to move yet). I showed K how to scoop a shovelful from the bag, and carefully move it to the planter, then flip the shovel. He did that a few times before he wanted to explore dumping the soil somewhere else. Looks like we need more spooning activities! Then, we made sure the soil was damp. K filled his watering can (also from the home gardening store) and dumped water into the planter. I stirred in the new soil and added more water. I also dug a few trenches in the soil to place our pea plants into. K could easily do these steps, but he was more interested in walking in circles at that moment and declined my invitation, so I did them on my own. Next, we moved the pea plants from their window box to their new home in the planter. I really liked how easy it was to transfer the plants without damaging their baby roots. K tried to put one plant in upside down, but the rest made it in safely. We tamped down the soil together with our fingers, and then set off to find sticks for the peas to climb. Here's the planter when we finished! Hopefully, the peas will flower and make snap peas for us to taste in a few weeks! How do you garden with toddlers?